Back in 2005 when the NUMB3RS television show premiered, I did a double take when I read that the show was to be based on mathematics in solving crimes. The premise was exciting to me, but I judged the probability of success for such a show would be quite low given the general public’s lack of interest in mathematics. Fast forward to the present and I’m anxiously anticipating September for the show’s premiere of its 6th season. The show recently celebrated its 100th episode. Imagine that, using mathematics as the underlying theme for a popular television show! NUMB3RS has become one of my few favorite television shows because it is so unique and hits so close to home with my areas of interest. The show is about a group of FBI agents, specifically the lead character of the show Don Eppes (played by Rob Morrow) who draws upon his younger brother’s abilities with mathematics to solve crimes. The show is filmed at Caltech although instead of using the Caltech name, the show refers to the school as “Cal Sci.” Each episode is based on another field of applied mathematics used to solve a crime. 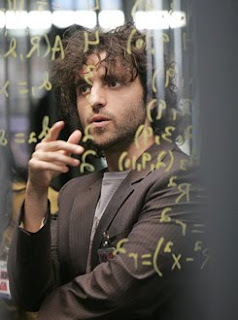 The genius character, Professor Charlie Eppes (played by David Krumholtz), typically saves the day by pulling out yet another mathematical miracle out of his bag of tricks. Many areas of applied math have been highlighted throughout the seasons, mostly based on probability theory and game theory. I enjoy freeze framing sections of the show on my Tivo so I can check out the mathematics shown to the viewers – blackboards, glass-pane boards, and instructional graphics used to demonstrate the particular mathematical theory being employed. The science is believable because the producers use excellent consultants to make sure the math used roughly parallels the storyline. The show hosts an excellent website that includes episodes for viewing online. Wolfram Research (makers of the Mathematica software) is the chief consultant to the show and hosts a companion website called “The Math Behind NUMB3RS” which has excellent reviews and analyses of the mathematics used in the various episodes. My favorite NUMB3RS episode mentioned the LIGO lab for gravitational wave research which was depicted as being underneath the Cal Sci athletic field. I assumed it was just made up for the show, but I later found that there really is an underground lab near the athletic field. It is a second lab to the 40 meter interferometer used to test new optics for LIGO. The secret lab is for Dr. Ron Drever, one of the three original founders of the LIGO project and one of the arms of the interferometer actually does stretch out near the athletic field. On a couple of occasions I took a walk over there to see if I could see any telltale signs, but nothing yet. For any other Physics Groupies out there, I highly recommend NUMB3RS as viewing fun for the entire family. I’m still waiting to find out when Larry (physics professor) will finally find a girlfriend!